Red Hot Repeater slot game is a totally unique concept and has gained a following of hundreds of loyal, regular players. It’s a classic 5-reel, 10-payline slot game with a red, hot twist! You’ll notice this immediately after loading the game as you’ll feel the game heating up in front of the background of flames! Red Hot Repeater slot game is a classic slot game with classic slot game symbols that burn up when you win! Fans of Ultra Hot Deluxe, Sizzling Gems and Inferno will really enjoy this red, hot slot game! Red Hot Repeater slot game is developed by Novomatic and brought to you by NovomaticCasino.co.uk. Goodness Gracious, Great Symbols of Fire! They say when you play with fire, you get burnt – but not with Red Hot Repeater slot game! In this game, when you play with fire, you get big wins! The symbols help you do that and the aim of the game is to spin three or more matching symbols on a payline, on consecutive reels from left to right, in order to see them light up and burn with a win! Red Hot Repeater slot game has all the classic fruit symbols: cherries, strawberries, grapes, watermelon, pears, lemons, oranges and plums, along with a golden bell and a red seven! The red seven is the highest-paying symbol and spinning 5 of these will give you a payout of x200 your bet! It’s widely believed that once you’ve been together with someone for a while, the flames of passion begin to die out. That’s not the case with Red Hot Repeater slot game! Even after playing for a long time, the repeater feature keeps the fire burning as it continuously heats up the game! Every time you get a win in Red Hot Repeater slot game, the repeater function is triggered. Several arrows will light up around the reels and travel along them like a red, hot snake! If it lands on the ‘repeat’ section at the top of the reels, your win will be repeated! This can keep on going and going, repeating and repeating your win until the red, hot repeater doesn’t stop on the ‘repeat’ section. 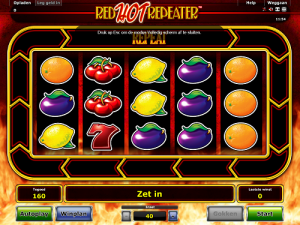 Red Hot Repeater slot game was developed by Novomatic and brought to you by NovomaticCasino.co.uk, and as such it has some classic features. Firstly, you can play for free until you’re ready to play with and win real money! You can also put Red Hot Repeater slot game into autoplay mode and sit back and relax while the reels spin themselves! Lastly, you can gamble your wins to make them even bigger! After the repeater feature has ended and you’ve been given your win – you can choose to collect it or gamble it. By gambling it, you give yourself a 50/50 chance of doubling it or losing it. All you need to do is guess whether you think the next card will be red or black! Thanks to our enormous collection of slot and video slots, you don’t have to keep on playing the same game! There are so many different ones to choose from, including some extremely lucrative jackpot slots! The jackpots of these jackpot slots often reach humongous sums! Choose between: Jester Jackpot, Jackpot Crown, Book of Ra Jackpot Edition and many, many more! We also have a wide range of the highest-quality table games and live dealer games which offer great return to player percentages (RTP), choose between: Sic Bo, Royal Crown 3 Card Brag, Live Poker, Live Baccarat and many, many more.